I sit here, in bed, recovering from my recent post-birth operation and am finally getting into the headspace to actually write about our experience of becoming parents so today I sharing our natural labor and delivery story. 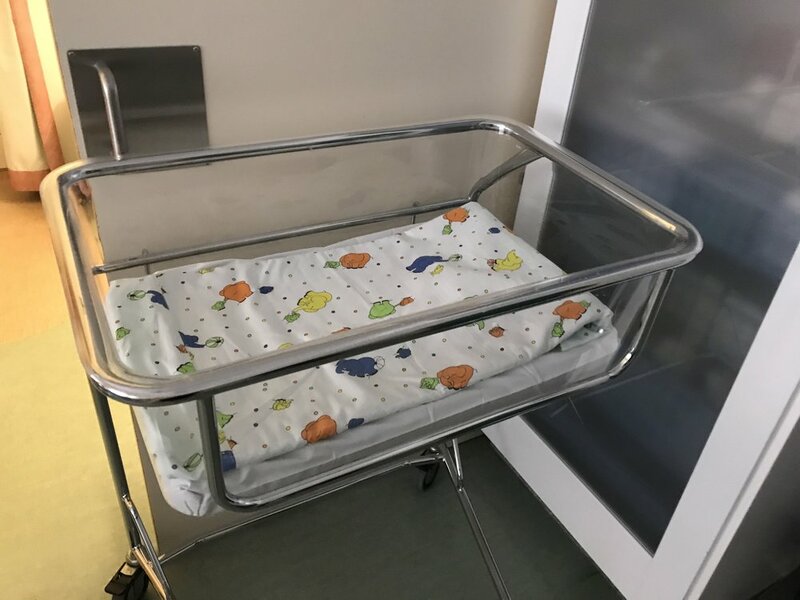 Our first child, Mia Elisabet, was born on the 21st June 2018 at Landspítali Hospital here in Reykjavik, Iceland. I had a 13 hours, natural labour and Mia arrived safe and sound into the world at 5:25pm. Here’s a run down of the big day. In the run up to my due date, I had met with our midwife Harpa at Bjorkin as, for some reason, the hospital and our local midwife were started to discuss the idea of an induction. I wanted to avoid this and so we discussed our options and she offered to do some acupuncture on me. I had never tried acupuncture before but found it very relaxing and well, let’s just say I believe it contributed a great deal to the next steps. Braxton Hicks contractions are the contractions you might feel before you are actually in labor. They act as a warm up, preparing your body but can drive you mad as you hope they will quickly turn into the real deal. There are a few ways to tell if your contractions are the ‘real’ or practise Braxton Hicks. Read up on this - but basically it’s all about timing and if they increase in frequency and strength. On the plus side, they tend to be more uncomfortable than painful and are a good sign as they help your body prepare for birth. Use this time to also prepare yourself mentally for contractions too. As many women do, I had Braxton Hicks contractions on and off for days before my waters actually broke. They didn’t get too bad - similar to a strong menstrual cramp - and were helped by massage (time for your partner to get involved) and a hot shower / hot water bottle to ease the discomfort. Such is life, we can never pick the perfect time to naturally go into labor and so we were far from ready. We had been ready, but then we went through a second kind of ‘nesting period’ and switched up a load of our appliances so the apartment was a mess. We had a new fridge/freezer and dishwasher delivered but not yet fitted. Ingimar and I tried to move the fridge into position - mostly Ingimar, obviously - and the dishwasher was still sitting in the living room on cardboard waiting to be installed. I had just been to the second hand furniture shop to buy a chest of drawers for the nursery, so they sat in the middle of the room waiting to be cleaned and painted. And to add to what I thought I would have time to achieve before I went into labor, I had just collected a fridge full of Isey skyr for a collaboration and was getting ready to shoot those pictures. So not the best timing, eh?! Ingimar and I went to bed early, cuddled up and watched ‘Knocked Up’ (as recommended by our Midwife as a fun but kinda realistic labor movie). Ingimar fell asleep, I finished the film and then drifted off. I woke up at 4am with an odd sensation and wasn’t sure if I needed to go to the toilet (safe bet as you go all the time when pregnant) and, yup, it all started. It’s a very odd feeling, a calm feeling really. It doesn’t happen dramatically and so you’re not sure if you just lost control of your bladder but then it doesn’t stop. Slowing but surely your waters have gone and the real adventure begins. I was feeling a little nervous but mostly excited, actually I was surprisingly excited. It sounds cheesy but I looked in the mirror and said to myself “you can do this, it’s time to have a baby“. Contractions started pretty much as soon as I returned to the bedroom and had told Ingimar. I took 2 paracetamol and lay down in bed. The contractions were similar to Braxton Hicks or very strong period pains but they were starting to get stronger, longer and faster. 05:20-08:30 | Ingimar is timing the contractions on the Pregnancy+ app. They are hard and long, harder than we expected so early into the labor, it’s a little confused so Ingimar calls the hospital to speak to them and let them know what our situation is. He then calls Gran Roza (over in Scotland) to let her know what’s happening and she looks up flights right away. I spent a lot of the later part of my pregnancy reading and watching positive birth videos to get a good idea of what to expect, and try to appreciate how different each Mothers birthing experience can be. I was very open to whatever was going to happen and tried to be as relaxed as I could - after all, baby was going to arrive how and when baby arrived. I had read about positive affirmations but wasn’t really sold on any. I knew about Hypnobirthing and had listened to some podcasts and tracks, but hadn’t really done much more. I read and read blog posts and articles on breathing - one stuck in my mind, I had been practicing it. Breathing Colour: so I did. I would breathe in a colour…and then breathe out that colour until it faded in hue completely - I did this, and this only for over 2 hours at home. I lay in bed, on my side, breathing in and out colours as Ingimar made calls. I’m not sure if we had music on but I had made a playlist and it wasn’t even used at any point in my labor. With no idea how I would progress, I asked for a cup of tea (laughable really) and some toast. By the time Ingimar returned with it, I was clearly progressing fast with hardly any breaks between contractions. He called the hospital again and they told us to come in. 08:30 | After speaking with the midwifes for the second time, Sonia gets up and dressed, we leave for the hospital. The contractions are now passing 3 minutes in length. I got up and slowly pulled some clothes on (a challenge indeed, why did I bother really). Ingimar ran down to the car with my hospital bag and made sure the car seat was fitted and ready. He brought the car to the door and came back up to help me. I was struggling to get dressed between contractions as they were so close together. From the bottom up I had managed my UGG slippers, Ingimar’s grey joggers (yup, light grey, so my still leaking waters were showing), but my own top and he put his dressing gown around me. Classy - not the outfit I had planned to arrive at the hospital in. 09:10 | Arrive at the hospital. Driving to the hospital must have been a nerve wracking journey for Ingimar to make but he appeared very calm. Luckily it’s only a 10 minute drive and rush hour (not that there really is one in Reykjavik) was over. Being in labor and being in a car is an interesting experience - and one that takes skill in hovering over the seat and holding onto anything whilst your body contracts. Luckily it is natural for your body to slow down a little when you change environment so I only recall having a few contractions in the car, and they were shorter. I do remember being stopped at the traffic lights whilst having a contraction and pulling the hood of Ingimar’s dressing gown over my head to hide from the cars beside us. Arriving at the hospital, no car parking space found - typical - Ingimar dumped the car at the door and we went in. I had written an “emergency: wife’s in labor“ sign to put in the windscreen but it was probably still on my desk at home. 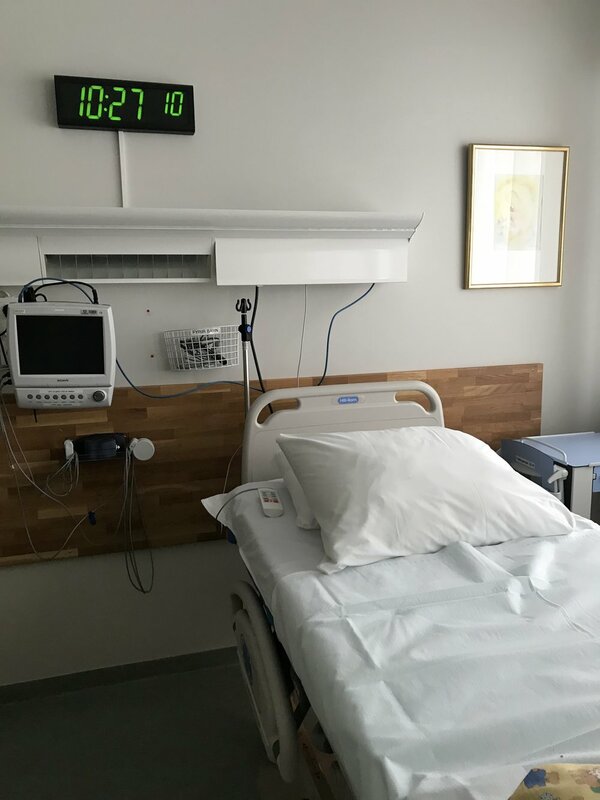 We took the lift up to where the midwife was waiting for us, she took us into a small room, helped me take my clothes off and examined me before covering me with a hospital gown. Between the journey, the contractions, all the breathing, I was a little delirious and thought that the midwife was our friends wife - she just looked alike. The midwife was pregnant herself and so after my labor I was convinced that our friends wife was pregnant. I was clearly already loosing it and I’d only had 2 paracetamol!! When the midwife told me that I was only 2cm dilated, I couldn’t believe it. I got worried. If I was already in this much pain and discomfort at only 2cm, how the heck would I cope?! I asked for something to help with the pain. She told me that one of the bigger rooms was almost ready so if I could hold on then I’d get something in the room. A few strong contractions later and we were walking into our birthing suite. The room was big. A suite. We joked that we had the 5 star suite. There was a bed and a good sized birthing pool, and there was Gas and Air. Thank goodness. We closed the curtains as I felt very aware that there was a building site opposite us. I got into my own clothes - a black cotton night dress and a t-shirt over the top. I started to walk back and forth in the room, breathing in the gas and breathing out colours. I did this for hours, I didn’t speak, I just walked back and forth. I think this was possibly the quietest hours Ingimar has ever experienced with me. I was in the zone, focussed and doing my thing. All this time Ingimar was updating the family and my Mum and her partner were on their way to Glasgow to board a flight to Iceland. I had no idea. The midwife left us pretty much to it, she came in to do her check ups, help untangle the Gas and Air tubing and chatted to Ingimar in Icelandic. Thankfully she reported I was now almost 6cm dilated. I felt relief, what I was doing was working, it felt good and I was in control. She said I could go into the birthing pool at any point so just to let them know and they’d prepare it. I was happy to keep walking for now but really wanted to try the birthing pool - in my mind, I felt like, if I left it too long then I might be too late for the pool. Ingimar continued to update the family. Mum boards her flight. I walked back and forth for almost 4 hours. I would stop every now and then to hold onto Ingimar and stretch my back out as much as I could. I also lent over the bed as he massage my back but it felt better to be constantly moving. I felt good, in control and managing on just Gas and Air. The midwife brought in a birthing ball and Ingimar helped me onto it. I bounced once and immediately stood up and kicked the ball away. I felt like the bounce had moved baby further up and certainly didn’t want that feeling. She then suggested we move to the pool to see if that helped baby. The pool looked inviting but trying to get in and out would be a little challenging. I took my clothes off, the midwife checked me before I got in and said I was almost 8cm. wow!! Once in, it wasn’t as relaxing as I had thought and I felt a lot more exposed. Naked in a pool, feeling and looking HUGE with two fully dressed people sat in front of you chatting in another language whilst you deal with contraction is a very odd feeling. I took the mask off and tried to join in the conversation between contractions. The midwife was trying to get Ingimar to go for some food as this would be a good time before it all got very real. I said go, then held the mask back tightly on my face as another contraction hit. Ingimar was back in no time. They asked how I felt - I honestly just felt like I had to do a poo and that it was stopping the baby from coming. From my research I knew that this was a good sign in labor as baby makes their way down the birth canal but I felt like I was blocking it. They got me out of the pool, on the bed and I was given a suppository. After a few minutes, I tried to use the bathroom (a first in front of Ingimar) but he patently helped me on and off the toilet and then back into the pool. Back in the pool, the weight of baby was off me and the longer I was in the pool, the more comfortable I got. Suppository in and now naked in a pool, I didn’t care what that outcome was - I held the Gas and Air mask tight over my mouth so it covered most of my face, eyes closed and breathing deep - I was in the zone and fully in my own headspace. I didn’t realise that this was it, baby was coming and I wouldn’t be getting back in the pool. Mum lands in Iceland, Ingimar’s sister meets her at the airport and they make their way to the hospital (they met Mia only 2 hours after she was born). I was almost 10cm, still on Gas and Air, back on the bed and trying out different positions. This is when I really started to feel the peak of pain, the challenge and the struggle to keep believing I could do this. I was strong enough and to keep trusting in my body. I knew it knew what to do but it felt like it couldn’t do anymore. I turned to Ingimar and said ”I can’t do this. Maybe I should get an epidural or something, what else can they give me?” At that point the midwife said it’s too late, you’re 10cm, time to start pushing. I lay back on the bed, I couldn’t believe I was about to delivery our baby. This bump was a baby, a real person and we would meet her soon. But I was so naive to think that it would happen soon and I would just push a few times, and out she’d pop. I hadn’t no idea how to push, I just felt like I was doing it wrong. It wasn’t working. That sounds ridiculous but I hadn’t read up on it. The midwifes were speaking Icelandic and Ingimar was doing his best to translate, help me, speak to them and keep calm. I was trying to stay calm, stay strong, stay in the zone but I didn’t know what was happening to my body or my baby, and if I was doing it right. I didn’t want to be lying down. I didn’t want to push yet, I didn’t feel ready. I took a deep breathe, dug my chin down and pushed and pushed and pushed. The midwife shift changed and we had a new midwife. I was now on a bed (where I didn’t want to be), with a new midwife and a husband who was not afraid of watching what was going on. I asked Ingimar to stay up at me, but then I did also keep asking him what he could see. The poor guy. The midwife told me to put the Gas and Air down and just go with the contractions. I kept pushing. Finally, after countless pushes, Ingimar said he could see her head - we were crowning. The midwife kept telling us that our baby would be here in the next contraction and to puuuush, I did so for 2 long hours. It was confusing, frustrating, exhausting - it took every muscle in my body. It took all of my remaining focus. It took everything we both had to give at that moment. I reached down to feel her head and her hair. I needed the motivation. Laying my head back on the bed, I looked up at the monitor and watched as a contraction started and I pushed with everything I had. They don’t call it the ‘Ring of Fire’ for nothing and it came as a shock with a side of panic to me, but once I knew what it was, I knew it wouldn’t be much longer before my baby was safely delivered. I let out an animal-like groan, Ingimar took my hand and said I’ll do it with you, we roared. We did this for 2 to 3 pushes - we were loud. The midwife said she needed to make a small cut to help baby, I had torn twice by this point so they gave me an episiotomy. One push and her head was born, two contractions later, one push and Mia was born. Mia is placed on my tummy as the umbilical cord was too short. She is perfect. She cried. She calmed, I calmed. She is our everything, instantly. I love her. I plan to follow up on this blog post with a Postpartum, 4th Trimester, recovery story and other related blog posts (and videos too but let’s not get ahead of ourselves). I have kept my labor & delivery story as honest and positive as possible, after all it was a very positive experience and one I want to record and look back on but this doesn’t mean that it went without problems. I was left with some serious tears and an episiotomy to heal and I feel it is important to talk about that too. If you have any questions or tips / advice you want to share, please comment below as I feel it is very important to be open and honest in taking about your experience with childbirth. Please keep comments supportive and kind.